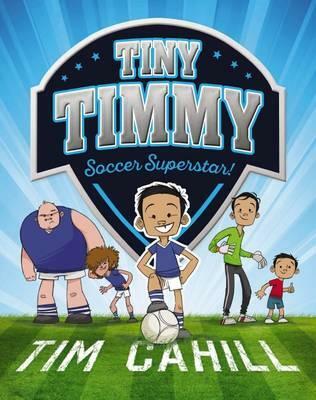 Buzz Words: Tiny Timmy: Soccer Superstar! Tiny Timmy has big dreams. He wants to play soccer. He wants to play in the school team. And he wants to become the captain and a super star. But after try-outs he finds he is given the position of orange boy. Coach tells him that if he practices hard he will make the team when he is bigger. So Timmy - with support from his best friend and brothers, and hindrance from Hacker and Studs – attempts in hilarious ways to grow. He becomes faster, stronger and more skillful, but not taller. Will he be able catch the coach’s eye and prove he is good enough for the team when he remains so short? Written for beginner readers in early primary school, Tiny Timmy is a new series to encourage new readers and increase their enjoyment of reading. Large, easy font, short chapters, loads of sketches and humour make this easy. Although very male-orientated (there are girls on the soccer team but all the main characters and siblings are male) sporty girls will be engaged by this story as well. The themes of persistence, practice and hard work are universal ones. Written by a Socceroos' legend, this is a good book for soccer mad kids who dream superstardom. Labels: book for boys, coach, Jenny Heslop, Scholastic Australia, Tim Cahill, Tiny Timmy: Soccer Superstar!